Here at Bowers we have a dedicated site high voltage maintenance team, where we can offer full on-site maintenance of all your electrical plant and power equipment and provide ongoing support 24 hours a day, 365 days of the year. Our typical maintenance agreement is based on a 5 year contract, and includes for 1 full maintenance of all HV equipment, and 4 annual inspections including oil sampling of Transformers. Transformer oil sampling and trend analysis is one of the key indicators to help identify a potential problem with a transformer and can prevent catastrophic failure. We are also able to offer bespoke contracts to suit customer’s requirements. As well as on site support, our maintenance customers, receive the full support of our technical team, including for the provision of HV network diagrams, oil trend analysis, information and recommendations on any operational restrictions, DIN’s and SOP’s. We will make recommendations on any suggested upgrade or modifications we consider necessary to improve the reliability and effectiveness of your network. Bowers Electricals Ltd have one of the largest stocks of both new and used power equipment, including HV Distribution & Power transformers and all associated HV & LV switchgear. Having this equipment readily available, allows us in a breakdown situation, help assist you to ensure the site is returned to operation within the minimum time frame and least disruption, reducing lost production and working costs. Ongoing maintenance records are vital! 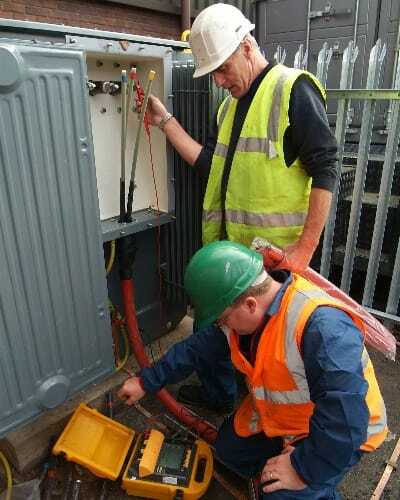 Not only will they satisfy the HSE that appropriate steps are being taken to ensure the integrity and safety of your power network and help to prevent potential prosecution under the health and safety guidelines, they will also help to satisfy any switching personnel that the network equipment has been appropriately maintained, and as safe as possible to work on. One of our site maintenance team would be happy to visit your site to carry out a free site survey on your equipment and put together a proposal for your consideration, call us now.